The former Prime Minister today released a video message on the eve of the final phase of the Gujarat polls, accusing him of spreading "falsehoods and canards" to score political points. 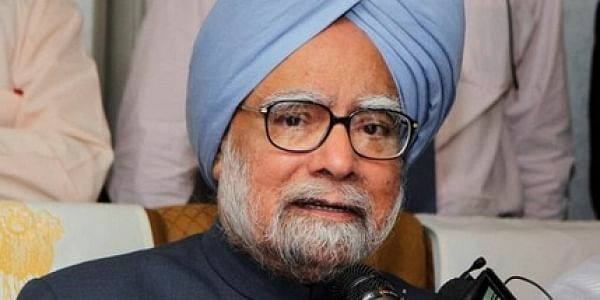 NEW DELHI: Escalating his attack on Prime Minister Narendra Modi, former premier Manmohan Singh today released a video message on the eve of the final phase of the Gujarat polls, accusing him of spreading "falsehoods and canards" to score political points. The sharply-worded attack was virtually the same as the written statement that the 86-year-old Congress leader had released on Monday following Modi's remarks insinuating that Singh had colluded with Pakistan in the Gujarat polls. "Fearing imminent defeat in Gujarat, desperation of Prime Minister to hurl every abuse and latch on to every straw is palpable," Singh said in the message released to TV stations. The second salvo by Singh in three days serves to ensure that there is no let up in Congress' charge against Modi ahead of tomorrow's polls in 93 constituencies of Gujarat. The remaining 89 constituencies voted in the first phase on December 9. Results will be known on December 18. The campaign was marked by fiesty and often acrimonious speeches where Modi and Congress president-elect Rahul Gandhi locked horns repeatedly. "I am deeply pained and anguished by the falsehood and canards being spread to score political points in a lost cause by none less than Prime Minister Narendra Modi," he said and demanded an apology. Singh and Modi ran into each other earlier today at an event to pay homage to the victims of the 2001 Parliament attack, and greeted each other briefly. The BJP hit back at Singh with party chief Amit Shah and senior leaders including Piyush Goel questioning the former prime minister's track record when he headed the UPA government. "We are seeing a very angry Manmohan Singh ji these days. We just want to ask him whether he was so angry when monumental loot and plunder was happening under his watch? The nation missed his anger then!" Shah tweeted. Singh urged the prime minister to show "maturity and gravitas, as expected of the high office he holds, instead of concentrating his energy solely on scoring "erroneously conceived brownie points". Strongly rejecting the "innuendos and falsehoods" made by Modi, Singh said he did not discuss Gujarat elections with anyone else at the dinner hosted by Congress leader Mani Shankar Aiyar as alleged by Modi and nor was the Gujarat issue raised by anyone else present at the dinner. "The discussion was confined to Indo-Pakistan relations. It is wrong and unfair to question nationalism of journalists, diplomatics and public servants present at the dinner," he said. Singh also asserted that Modi "is setting a dangerous precedent by his insatiable desire to tarnish every constitutional office, including that of a former prime minister and Army Chief", and described it as sad and regrettable. The Congress Party needs no sermons on "nationalism" from a party and prime minister, whose compromised track record on fighting terrorism is well known, he added. Pointing out that Modi had gone to Pakistan uninvited after the terrorist attacks in Udhampur and Gurdaspur, Singh said "let him also tell the country the reason for inviting the infamous ISI of Pakistan to our strategic Air Base in Pathankot to investigate a terror attack that emanated from Pakistan."